When Friday night rolls around, you better be prepared with the right style. When style and fashion are important to you, there are Walking Suits and then there are Pronti Walking Suits. Pronti has a way with style that few other Mens Clothing brands can match. You'll always find something new and exciting to wear when shopping for Pronti Walking Suits at ContempoSuits.com. 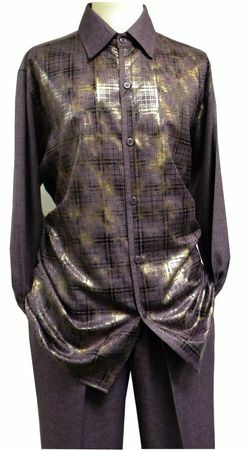 This Purple heather Pronti Walking Suit is just what the Doctor ordered. The pants are single pleated and the fabric is made of Wrinkle Resistant Poly/Spandex so you stay looking sharp all night long.